Bunk bed Size Bed Dimensions are twin bunk bed 39 inches wide x 75 inches long and full bunk beds 54 inches wide and 75 inches long. These are fairly standard bunk bed size bed measurements. Bunk bed Mattress depths can vary from just a few inches to 6 inches or more. Bunk bed depths are very dependent upon bunk bed safety rail heights and there are VERY specific Federal regulations about this. Many times, actual bunk bed mattress dimensions will vary by one or two inches, usually smaller. BUNK BED SAFETY Please Visit the Consumer Product Safety Commission website for an in-depth look at bunk bed safety concerns. Because addresses change over time and we want to be sure you can access their current rules, please Google Federal Consumer Product Safety Commission and when on their site search Bunk beds. That will give you up to date bunk bed safety rules. We can never be too careful when children are concerned. Bunk beds have been with us for many years and the concept behind the bunk bed has been around for a thousand years or more. The concept of stacking beds, one atop another, may go back to the days of ancient seafarers. Aboard most types of ocean going ships, space is at a premium. Berthing space for the crew was particularly tight. During the days of sail ships, the crew rarely had fixed bunks or beds. The most common type of bed was a hammock. It was not usual for the hammocks to be hung from the deck to the overhead, or for the landlubbers among us, from the floor to the ceiling. One atop another, there would be precious little room between you and your crewmate. The use of hammocks continued until the mid twentieth century. Modern ships switched from hammocks to bunk beds with two or more beds atop each other. There may have been as little as twenty or so inches separating each bunk. Ships are not the only place where bunk style beds are found. Bunk beds have long been used to maximize available space. Whether in a military barracks, summer camp, college dorm, or a childs room, bunk beds are a great way to make use of limited space. The standard bunk bed is made up of a frame and two mattresses. 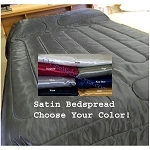 There are several different types of support systems used for the mattresses. Heavy duty metal frames are usually constructed with a link spring that is by far the best way to support the mattress. The link spring consists of a set of metal rails with several strong metal supports and a series of metal links spaced approximately four inches apart that provide some flexibility and lots of support. The link spring system was also used on some wood frame bunk beds. A common design for a bunk bed combines the frame and a thin box foundation that is often referred to as a Bunkie board. The Bunkie board is usually no more than two or three inches thick. Rail that run the length of the side frames support the Bunkie board and the mattress is placed on top. There are also mattresses that are especially designed for use with bunk beds. This one piece design integrates the Bunkie board into the bottom of the mattress. Most factory made bunk beds stick to a standard dimensional design. In place of a Bunkie board, some bunk bed designs make use of a tried and true way to support the mattress. The wood slat has been used for many years to support a box spring and mattress combination or even just a mattress. The slats are placed inside the side frame of the bed and run perpendicular to the side frame. Some important things to check include the length and thickness of the slats. If the slats are too long, forcing them into place will stress the frame and the frame could fail. If they are too short, you run the risk of having them shift and possibly fall out. If the wood used to make the slat is too thin, the slats may fail under the weight of the sleeper. The type of wood used to make the slats is also important. Avoid using any type of plywood since plywood is not designed for that application. The grain of the wood should run in the same direction as the slat is long. Never make or use slats where the grain of the wood runs perpendicular to the length of the slat. There are a couple of things to remember when purchasing a mattress for a bunk bed. When purchasing a mattress for a bunk bed you must keep in mind that they have definite height limitations. A pillow top and some plush top mattresses used on the bottom bunk may be too tall to allow sufficient space between the beds. The height of the mattress is also an important consideration for the top bunk. Mattress height is of particular importance when it comes to using the top bunk for a child. Many bunk bed designs incorporate some type of safety rail system. The safety rail system is in place to prevent accidental falls from the upper bunk. Placing a mattress that is too tall on the top bunk may exceed the height of the safety rails. If the upper bunk is used for a child, never, under any circumstances remove the safety rails or use a mattress that is taller then safety rails. The average height of a standard twin sized mattress is eight to ten inches. 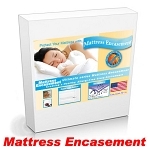 There are many fine quality standard height mattresses available. Buying a quality set of bunk beds can have definite advantages for growing families with children. Many bunk beds are designed so they can be separated into two beds. This can be a very important consideration when kids are involved. As the kids grow, they may what their bed in their own room. Two piece bunk beds, though perhaps a little more expensive, can be used far a very long time. The space saving advantages of the humble bunk bed is pretty obvious but deserves to be repeated. Bunk beds are great for small rooms but they are an easy way to provide additional space in a larger room. A popular bed design that takes advantage of spacing making is the loft bed. The loft bed provides an elevated sleep platform with space available underneath. The space under the loft can be used for other furniture needs such as a desk, sofa, or futon. Loft beds are very popular for college dormitory rooms and other places where you wish to combine sleep space with other needs. So whether you need to have enough room for a growing family or you are college student trying to maximize space, a bunk or loft bed could be right for you.